The woodchipper has been reserved, and will be delivered Friday 11/9 to be set on a work flat. We will need a couple of sharp saws, so we are not picking big stuff. 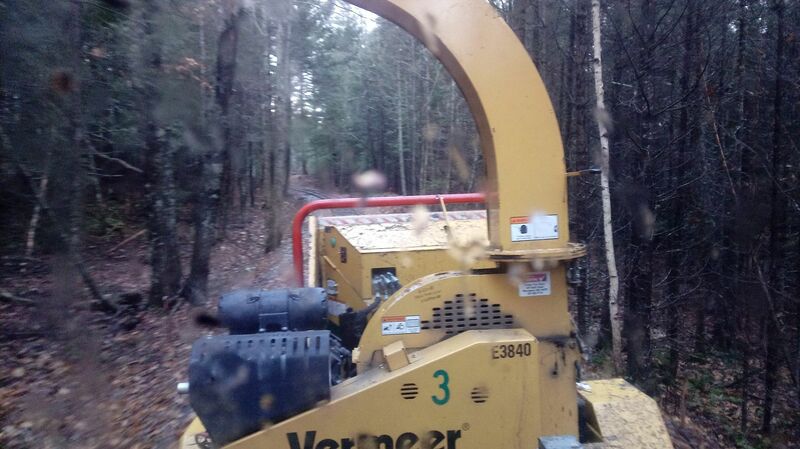 The chipper will run as much as possible to get all the use we can out of it, and make renting it worth it. Saturday Nov 10th forecast is currently saying mostly sunny with temps in the 50's. This is Maine, and the forecast is bound to change faster than a traffic light on Route 1, but hoping that forecast holds true. It would make for a very pleasant day. 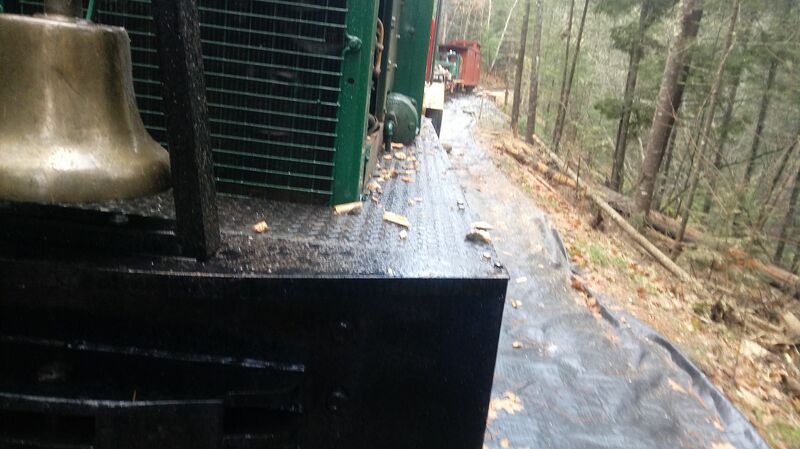 Reminder, safety glasses and hearing protection around the chipper. Bring yours if you have some you like. We do not have much extra for eye protection, so do bring that. We do have some hard hats with all of that on there if someone needs. I would like to leave Sheepscot with the Woodchipper Express between 7:30 and 8, and the train can follow anytime after, probably at 8:30, to give time for those traveling to get there. We may also run a mid morning shuttle to pick up anyone else that came later. We will return to Sheepscot for lunch. Cindy is talking about making a chowder. We will be wrapping up around 3, to make it back in time for the Board Meeting. Forecast has changed slightly. 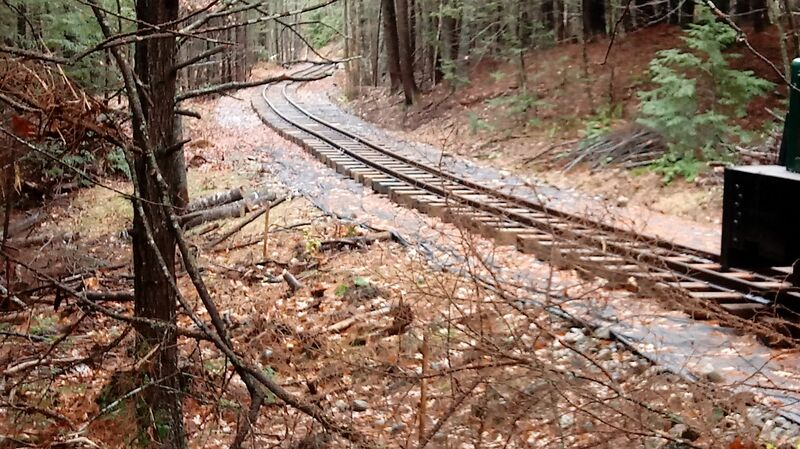 Now cloudy in the morning, chance of lingering showers from Friday, with a high of 45 expected..
Are you working along the new, down the mountain, track? If I came up around 9am Sat., should I park by the bridge and walk up to the work area? Are you planning on working Sun. also? I plan on starting at TOM, and proceding North. 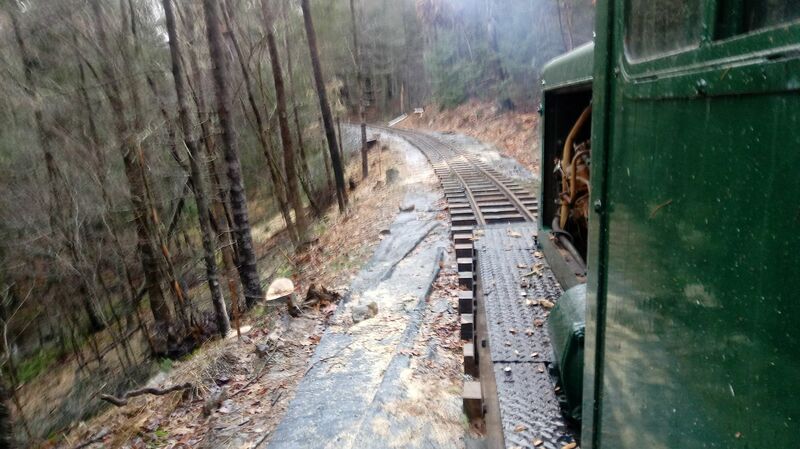 We will have the railroad to ourselves, no scheduled trains. So we could plan a mid morning 9, 9:30, or 10a return to Sheepscot to collect more help. If you would like to park at the bridge site and walk up, that is up to you. We will be working that way, to location 9. 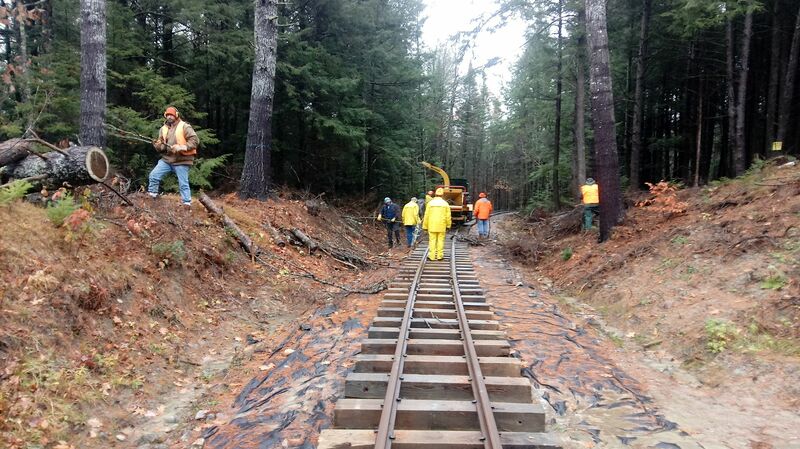 Barring any unforseen problems, the chipper express will depart Sheepscot around 7:30 or slightly before. 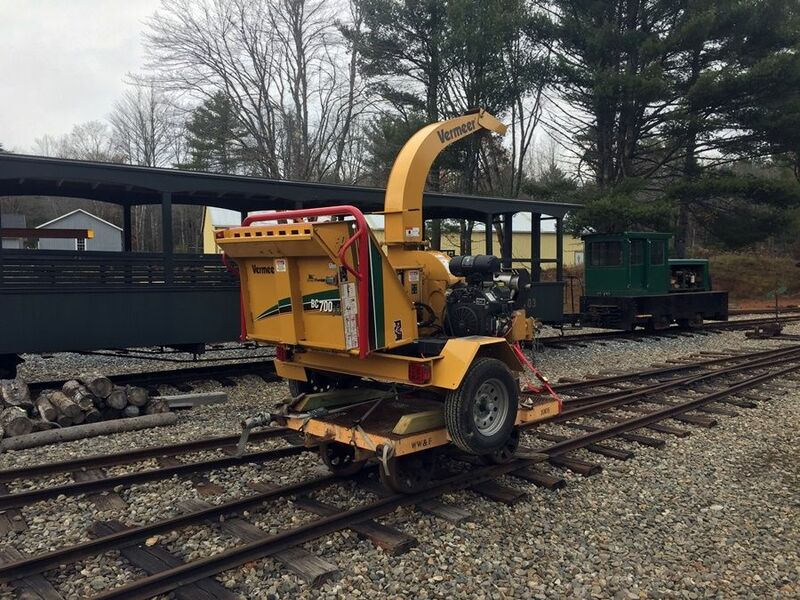 This will be just the wood chipper and a borrowed locomotive. Limited riding ability with this train, so I will probably be solo. 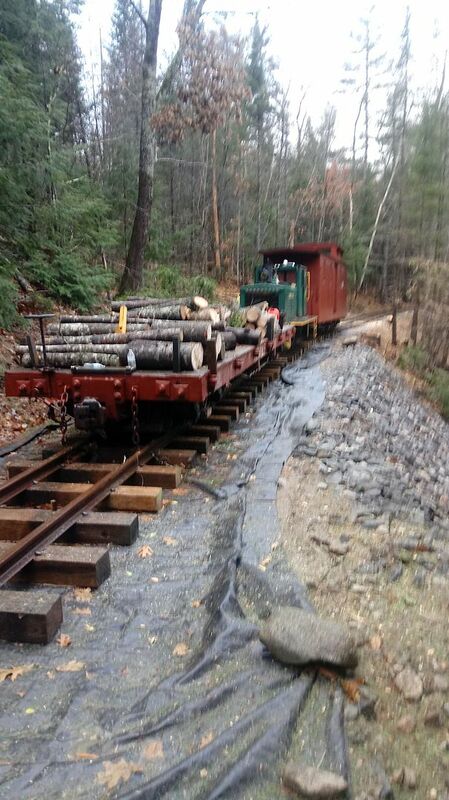 The diesel will be departing Sheepscot about 8:15 with the flat and a passenger car. 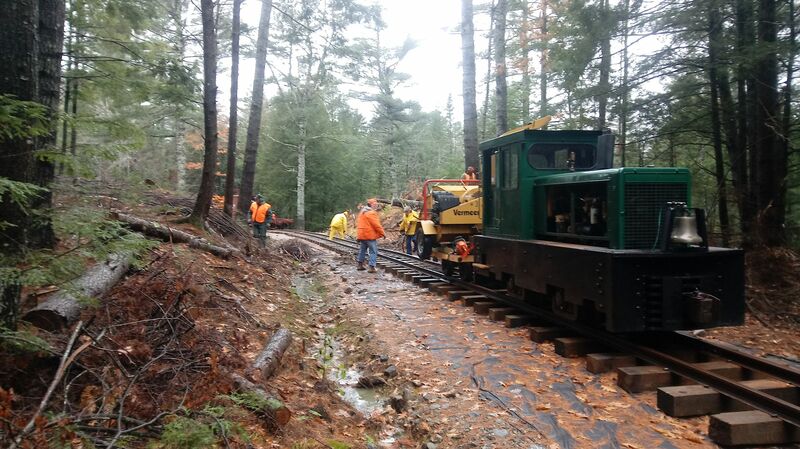 The flat car will be positioned for loading and skated, so the train can return to Sheepscot to pick up more help, probably leaving Sheepscot around 9:30. We will break for lunch around 11, and wrap up for the day around 3. Weather may be a little damp first thing, but expecting that to clear up..
Wood chipper loaded up for tomorrow. Where did ML&M's Brookville come from? MNG? We are just getting going, and things are finally going good. Tree across the tracks ahead..
James said we had chips on our shoulders, well, that wasn't the only place..
We did open up the inside of the curve approaching the slide. A little better visibility..
Rained off and on most of the day. This is looking south, preparing to head back.. Thanks to those that helped, we reached location 5 on the map.. The stretch we did looks very good. Thinking of doing it again in December, but need to work out the details..
Looks very nice, Mike. Thanks for posting the photos. The chipper work is slow, and handling the brush after it sat all summer was less than fun. I am really going to push that we go back to the old way of cutting and burning that day. It did work real well when I cut standing trees, and the brush was handled just once, right into the chipper, and wood loaded on the flat. Looks like you had a decent size crew. The r-o-w looks great. You mean Fair Weather Fred? Just kidding. He did not want to get wet and catch a cold. He volunteered to organize the wood we brought back though, and make sure it got to Johnny if that is where it is going. I believe he plans on doing that Monday.